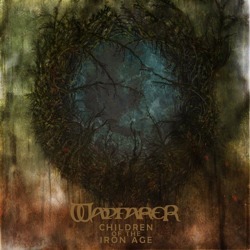 American atmospheric black metallers Wayfarer from Denver, Colorado has revealed the first details of their debut full-length album “Children of the Iron Age“, scheduled for release in digital and physical form the summer of 2014. The band has released so far a demo in 2012 with incomplete line-up, so “Children of the Iron Age” is actually the first complete work of the band, having a running time of 68 minutes. It was recorded at Flatline Audio in Westminster, Colorado with Shane Howard (Martriden), mixed and mastered in the same studio by Dave Otero (Cobalt, Primitive Man, Nightbringer). Wayfarer have unveiled the beautiful cover artwork by the fantastic Stigma: Sam Nelson’s Art, as well as the album tracklist. In the Bandcamp page you can listen to the song “Forests Ash by Dawn” from the upcoming album and get a taste of their music.